An artist’s impression of the building. Originally published in the Otago Witness, 21 April 1915, and reproduced here courtesy of the Otago Daily Times. The old Whitcombe & Tombs Building turns one hundred years old this year. Together with the larger complex of buildings behind, it had a long association with the printing, stationery, and bookselling trades. In the late 1870s, an L-shaped site with frontages to both Princes and Dowling streets was taken over by Fergusson & Mitchell. This firm of printers had operated in Dunedin since 1862, when Glasgow-born John McNairn Mitchell arrived to start the New Zealand arm of a business he had co-founded in Melbourne. The premises included a printery, bindery, warehouse, and one of the best-stocked stationery shops in the colony. Some very fine examples of typography can be found among their nineteenth-century print productions. The buildings they acquired included wooden shops dating from the 1860s, as well as brick structures built in 1869 and 1877 to the designs of R.A. Lawson. A serious fire in 1901 was followed by a phase of rebuilding, which included the erection of Clyde Chambers on Dowling Street (this building was demolished in 1990). 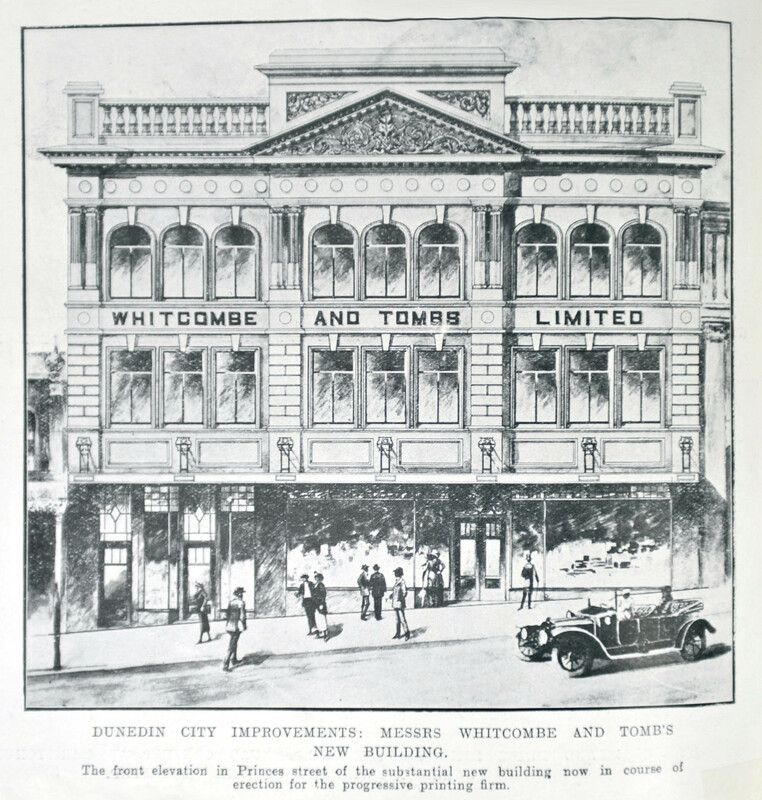 Mitchell died in 1914, and in the same year his company was bought out by Christchurch-based competitor Whitcombe & Tombs, which had run a Dunedin branch since 1890. Despite war conditions, business was booming, and George Whitcombe remarked that ‘There is hardly a single novel this season that is worth reading and those we have not got, but we are selling the old ones like hot chips’. Determined to build one of Australasia’s best book shops on the new site, Whitcombe & Tombs announced that ‘new premises are to be erected almost immediately, and will be in keeping with those occupied by the firm at Christchurch and Wellington’. 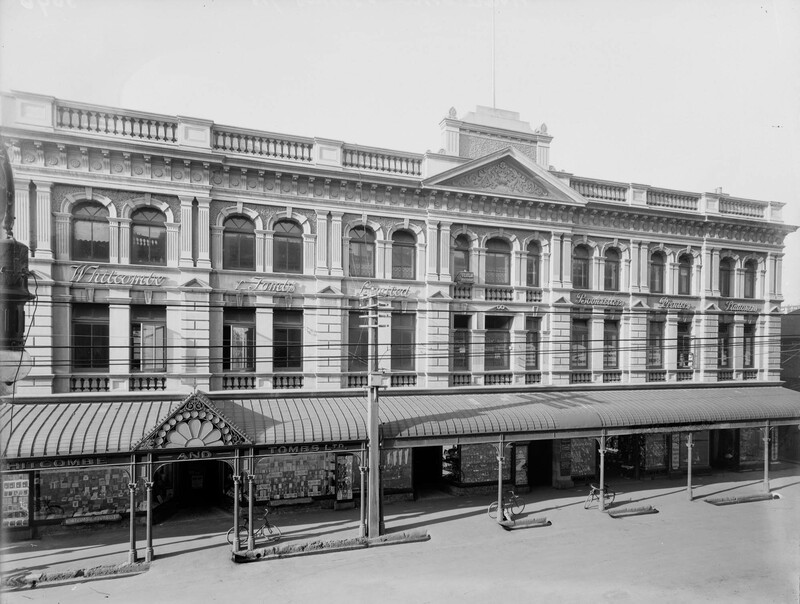 The architect for the Dunedin work, Edward Walter Walden, closely modelled the façade on the central portion of the larger warehouse in Cashel Street, Christchurch, designed by Collins & Harman in 1906. Classically influenced, in the free Revived Renaissance style, it was an imposing and elaborate three-storey composition with a massive tympanum and square pediment at the centre of the parapet. Despite the entirely fresh street appearance, many of the old buildings remained at the rear. The Christchurch warehouse of Whitcombe & Tombs designed by Collins & Harman, completed in 1907. Steffano Webb Collection, Alexander Turnbull Library, 1/1-005652-G. The contractors were Fletcher Bros, led by 29-year-old James Fletcher, and the new building was ready for occupation in November 1915, nine months after the construction contract was signed. The cost was nearly £9,000. The book shop was the biggest in Dunedin, and at one time there were about thirty shop staff. The annual sale was a keenly anticipated event. Adjoining the firm’s shop was a smaller one that was leased out, as were some of the offices upstairs. The buildings were seriously damaged by a fire in May 1955. This originated in the neighbouring Beau Monde Café and took hold in the printing department at the rear. 1,700 metres of hose from fifteen hose deliveries was run out to fight the blaze, and four firemen were injured. Losses exceeded £100,000, and the fire sale that followed attracted huge crowds eager for bargains. 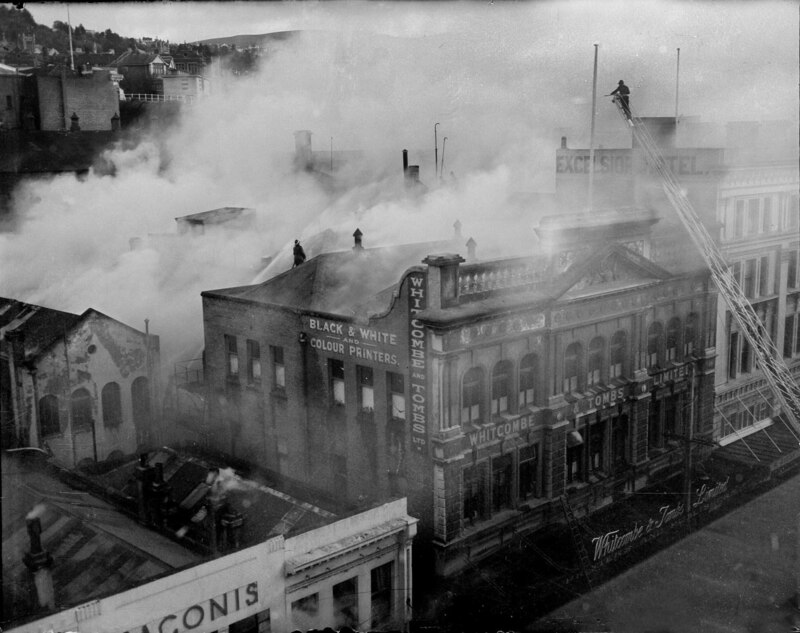 The scene of the fire in May 1955. Photograph originally published in the Evening Star and reproduced here courtesy of the Otago Daily Times. Plans for the reinstatement the buildings were designed by L.W.S. Lowther and built by Mitchell Bros between 1956 and 1957 at a cost of £36,000. Even allowing for inflation this was more than the cost of the 1915 building. Some structures at the rear were replaced and a hangar-like extension referred to as the ‘cathedral’ was created. The Princes Street frontage was retained but some of the ornamental features were removed (mostly at the parapet level). In later years printing operations centred on separate premises in Castle Street. In 1971, Whitcombe & Tombs merged with Coulls Somerville Wilkie, and the new name Whitcoulls was introduced in 1973. 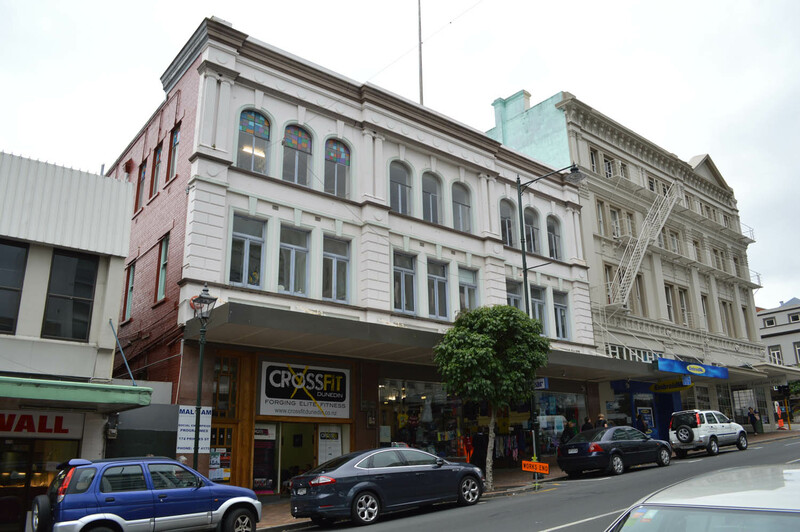 Whitcoulls joined Dunedin’s retail drift north, away from Princes Street and the Exchange. The firm was one of the founding tenants in the Golden Centre when it opened in 1979, and in 1984 opened a large store on the former Andrew Lees site in George Street. The Princes Street shop continued for a few years before closing its doors for the last time on 30 April 1986. At the time Excelsior Holdings intended to demolish both the old Whitcombe & Tombs building and the Excelsior Hotel next door, and it was thought that Whitcoulls might open an outlet in a new mall on the site. A plan subsequently emerged for a large office tower but this was one of a number of local schemes abandoned around the time of the 1987 share market crash. A clue to building’s old identity can still be seen by pedestrians. 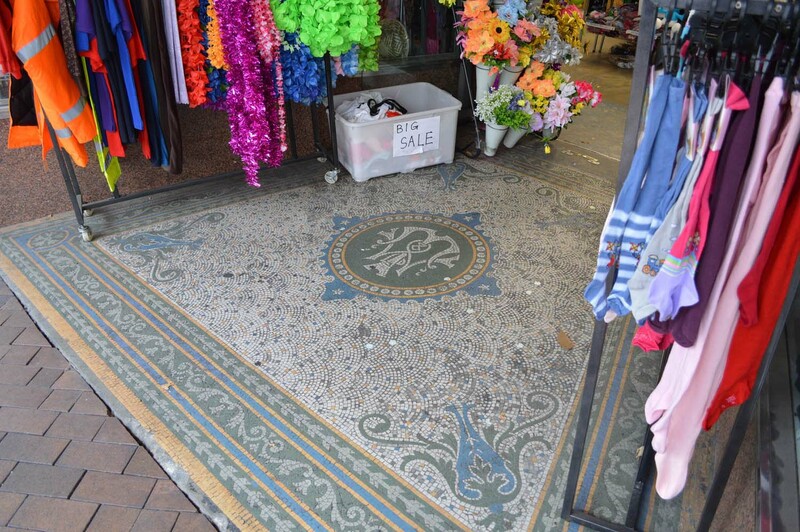 In the late 1990s, when Diggers Bar and Saloon occupied the old shop space, 1950s tile were lifted from the entrance to reveal a beautiful mosaic tile floor. At the centre can be seen the monogram ‘W&T Ltd’. Otago Daily Times, 12 June 1869 p.1 (tender notice for G. & T. Young premises), 20 December 1876 p.2 (Beissel fire), 5 February 1877 p.1 (tender notice for Beissel premises), 30 July 1877 p.7 (description of Beissel premises), 1 March 1879 p.1 (Fergusson & Mitchell additions), 20 January 1915 p.1 (tender notice for removal of buildings), 8 October 1979 pp.23-40 (Golden Centre), 6 March 1984 p.24 (George Street store), 30 April 1986 p.3 (closure of Whitcoulls), 9 May 1955 p.1 (fire); Otago Witness, 14 August 1869 p.17 (description of G. & T. Young premises); New Zealand Tablet, 13 June 1879 p.18 (Fergusson & Mitchell occupy Beissel premises); Evening Star, 9 May 1955 p.1 (fire). This entry was posted in Uncategorized and tagged 1910s, 1915, Book sellers, E.W. Walden, Fergusson & Mitchell, Fletcher Bros, L.W.S. Lowther, Mitchell Bros, Printers, Renaissance revival, Whitcombe & Tombs on 28 June 2015 by David Murray.